UBox is one of the newer faces on the portable storage unit and moving scene, but is under the wing of well known truck rental agency, U-Haul. This has made it easy for UBox is easily be integrated within the existing infrastructure of the company. 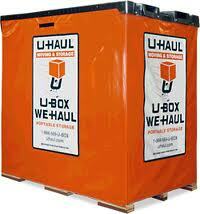 There are a number of differences between UBox and other U-Haul services to keep in mind. To give you a better idea about what they have to offer, here is a quick UBox review. Much like other portable storage units, you can use UBox for both storage and moving. There is only one size of unit, which is 5 feet by 8 feet by 7 feet. This will normally be enough room for an average room and a half. To keep everything dry, the floor rests 6 inches above the ground. Every unit is made out of pressure treated plywood. The reason for this is that the plywood can breath, minimizing the risk of mold and mildew which can be a problem with steel storage units that have become popular. One of the biggest benefits of UBox is that you can either use truck deliveries to have everything brought to you or you can go to them. This is particularly useful if you are trying to save money because you can avoid truck delivery fees by going to the facility directly. The same is true if you are moving because aside from shipping fees, you can avoid all of the other truck charges. Another benefit of using UBox is that they offer comparatively inexpensive damage insurance. The coverage ranges from $1000 to $20,000 at a cost of $12 a month to $40 per month. This will often be much less expensive than purchasing it separately. One of the biggest potential drawbacks is shipping expenses, which are only assessed when you need your UBox to get shipped from one facility to another. For example, if you are moving your entire home, which will likely require between 3 and 5 UBox units, from the Pacific Northwest to the Midwest, the shipping fees will likely be around $4,000. This is much less than it could cost to rent a moving truck from U-Haul. At the same time, this cost is comparable, if not less expensive, than shipping portable storage units through other companies because U-Haul already has huge network of facilities and complimentary infrastructure. Overall, UBox seems to offer a number of unique benefits over some of the competition. At the same time, there are some potential drawbacks as well. Some of the biggest benefits stem from leveraging U-Hauls existing infrastructure such as providing inexpensive insurance and a variety of different usage options. One of the biggest issues to consider is what type of unit you need to have. UBox is made from plywood in order to lessen the risk of mold and mildew, however some people still prefer steel. Size can also be an issue if you need to move and store a lot of items because there is only one size of box and it may not be large enough. At the same time, the smaller width, makes them a great resource for people living on narrowing streets where larger portable storage units may not fit. The worst experience ever. U-Box can’t even tell you where the boxes are or when they will be delivered, and that is if you can even reach a human to talk to. Don’t bother trying to talk to someone and the local U-Box; all calls go through the corporate call center. We were promised delivery three times. They lied about delivery. Boxes are made out of cheap plywood and warp. We had a horrible time getting the box to close due to the warped door. Take my advise and go with IPOD or anoyone else! !